Deadline: May 1, 2019. 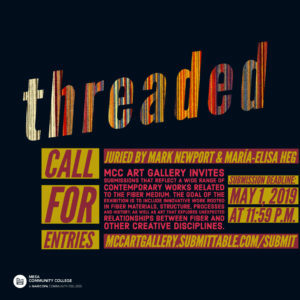 Juried by Mark Newport, Artist in Residence and Head of the Fibers Department at Cranbrook Academy of Art; and María-Elisa Heg, Curatorial Fellow at the Houston Center for Contemporary Craft. Mesa Community College Art Gallery invites submissions that reflect a wide range of contemporary works related to the fiber medium. The goal of the exhibition is to include innovative work rooted in fiber materials, structure, processes and history, as well as art that explores unexpected relationships between fiber and other creative disciplines.